This billboard now greets people arriving in Illinois via I-64/55 from Missouri. Earlier this year, staff members of Hope Clinic for Women saw news reports about an intriguing Colorado billboard. “Welcome to Colorado, where you can get a safe, legal abortion,” the billboard read. Hope soon learned that the Colorado billboard, created by ProgressNow Colorado, a progressive advocacy group, was placed just outside of the border with Utah, where getting an abortion requires much more hassle. “We saw the billboard campaign and just loved it,” explains Alison Dreith, the media relations coordinator for Hope. It reminded Hope Clinic of its own situation. 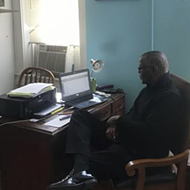 Located just ten minutes outside of downtown St. Louis, the Granite City, Illinois, abortion clinic often receives patients who don’t want to deal with Missouri’s frustrating regulations. It wasn’t long before the light bulb went off: Hope would commission a billboard of its own. 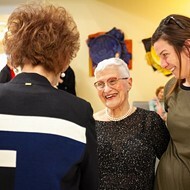 After receiving permission from ProgressNow Colorado, on March 20, Hope placed a billboard on I-55/64 proclaiming, “Welcome to Illinois, where you can get a safe, legal abortion.” “It was just a no-brainer for us,” Dreith says. Even though it may seem like Illinois is poking Missouri, the matter is much more serious. Half of Hope’s patients travel from Missouri because of the state’s restrictions. Dreith points to the 72-hour waiting period mandated by Missouri law as a particularly frustrating and needless regulation. Patients seeking abortions must wait at least 72 hours between getting consultation and an abortion — tied for the longest waiting period of any state. “It’s not only taxing on your time and you wallet, but also your emotions,” Dreith says. Currently, Missouri state lawmakers are working to disallow abortions after six weeks into pregnancy, when a fetus’ heartbeat first appears. Yet by six weeks, Dreith says, many women don’t even know that they’re pregnant. Illinois, on the other hand, has been at the forefront of abortion rights. House Bill 40, which was signed by Illinois lawmakers in 2017, even allows Medicaid funds to pay for abortions. 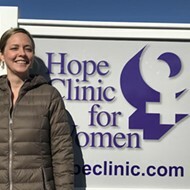 Dreith, who lives in St. Louis, says that Hope Clinic wants to use the billboard to “call attention to the drastic different realities” between Illinois and Missouri. 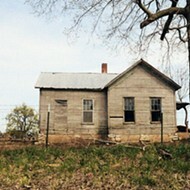 Still, Dreith notes, it’s not just Missouri that Hope receives patients from. Some come from as far as Kentucky or Mississippi. 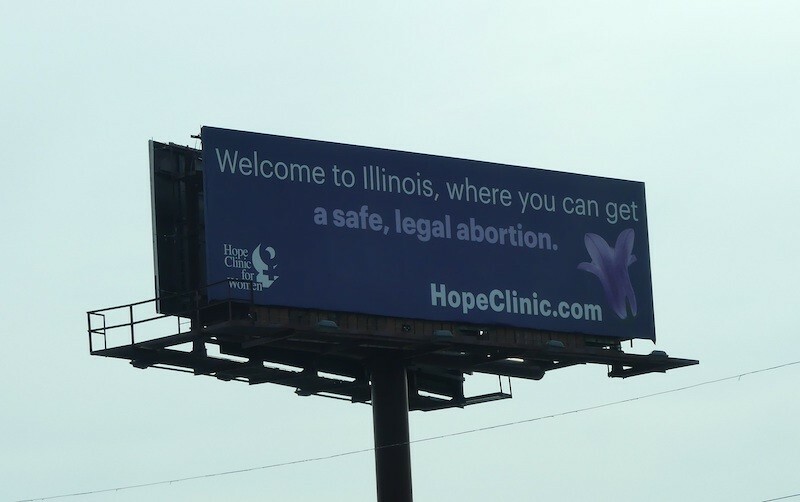 And regardless of where they’re coming from, Hope Clinic is happy to welcome them to Illinois.